The desirability or otherwise of the wine character known as "Brett" is one of the most controversial issues of recent times. Arguments have been made for Brett character being a complexing and a legitimate expression of natural, uncomplicated winemaking, while others view it simply as an unattractive wine fault that results from poor winery hygiene and sloppy winemaking. But what is Brett character and how and why does it appear in some wines? The wine character described as "Bretty" comes in various forms. It is the combined result of the creation of a number of compounds by the yeast Brettanomyces bruxellensis, and its close relative, Dekkera bruxulensis. The three most important known aroma active compounds are 1) 4-ethyl phenol (4-ep), which has been variously described as having the aromas of Band-aids®, antiseptic and horse stable 2) 4-ethyl guaiacol (4-eg) which has a rather pleasant aroma of smoked bacon, spice or cloves and 3) isovaleric acid which has an unpleasant smell of sweaty animals, cheese and rancidity. Other characters associated with Brett include wet dog, creosote, burnt beans, rotting vegetation, plastic and (but not exclusively caused by Brett) mouse cage aroma and vinegar. Brettanomyces has been isolated from the outside of grapes and from winery equipment. However its, favoured winery haunt is the oak barrel as it often provides for conditions that strongly favours its growth. Certain conditions are known to favour the growth of Brettanomyces during winemaking. If low free sulfur dioxide levels are coupled with high wine pH and warm temperatures during barrel maturation, then issues may arise. If older oak is used and the wine has a reasonable amount of dissolved oxygen, …. look out! Furthermore it is thought that Brett can also multiply after bottling if the wine contains residual fermentable sugars, a situation made more likely if the wine was minimally filtered. Lets look at the why's of these factors. Brettanomyces proliferates under warm cellaring conditions. Twenty degrees C is an ideal temperature, with even small reductions in temperature seriously hamper its growth. Sulfur dioxide is an anti-microbial agent that is added by winemakers throughout the winemaking process. If it is added in sufficient amounts, and the pH of the wine is reasonably high (SO2 is more effective at higher acidity levels), then the growth of Brett will be retarded. On the other hand, high alcohol levels and the existence of even small amounts of fermentable sugars such as glucose suit the growth of Brett, as they are its preferred source of energy for growth. Some recent research under laboratory conditions suggest that Brett does not grow at alcohol levels above 13%. However, this result is not consistent with the observation that many wines with alcohols far in excess of this have gone bretty under winery conditions. Filtering the wine before bottling can reduce the numbers of Brett cells, and hence the incidence of Brett character that develops in the bottle. However, there is anecdotal evidence that filtered wines that are sound at the time of bottling can randomly become infected with Brettanomyces after a period of time, probably as a result of the bottled wine containing residual sugar and being stored in warm conditions. It is widely acknowledged that the majority of wines with Brett character, became that way during the period of barrel maturation, particularly if second use (or older) oak barrels were used. Brett can colonise a barrel between fills, and can begin to reproduce when the barrel is refilled with new wine. Figure 1 shows Brett extending pseudomycilium into the surface of an oak stave. Topping up barrels with a wine which contains Brett cells, may also contribute to those barrels 'going Bretty'. Shaving and re-toasting the inside of re-used barrels significantly reduces the incidence of Brett growth. However, it is also worth noting that the use of new barrels does not guarantee that Brett will not appear. Recent work in California has shown that new barrels filled with sterilised wine can still sustain populations of Brett high enough to produce above threshold levels of 4-ep. But why does oak maturation particularly favour Brett growth? Firstly, Brett is a slow growing yeast that does not compete well against other micro-organisms. During alcoholic fermentation the wine yeast Saccharomyces out easily out-competes it. Two possible reasons are that it naturally grows slower than Saccharomyces, and that it prefers aerobic conditions for growth. During primary ferment, the wine is saturated with carbon dioxide which makes for a hostile environment for Brettanomyces. On the other hand, barrel maturation is a step in conventional winemaking that provides both the time and the lack of competition needed for Brett to successfully grow to levels which results in sensory modification to the wine. Wines stored in barrel are usually lower in SO2 and are kept warmer than at any other time (other than during ferment of course). This is necessary so as to encourage malolactic fermentation (MLF). Lastly, the necessary processes of racking off lees and regularly topping up barrels ensures that there are always reasonable levels of dissolved oxygen in the wine. For all these reasons, it is thought that the time between the completion of primary fermentation and the start of MLF this is the most likely time that Brett multiplies and produces brettiness in wine. Brettanomyces Character is Seen Primarily in Red Wine. Why? One final matter concerning Brett is rarely mentioned. It occurs almost exclusively in red wines. Why is this so? Red wines have a much higher level of tannin like substances called coumaric and ferulic acid than do white wines as they are extracted from the skins of grapes during red wine fermentation. The wine yeast Saccharomyces and some lactic acid bacteria such as Lactobacillis have enzymes which degrade these acids to weakly smelling intermediates called 4-vinyl phenol and 4-vinyl guaiacol (Step 1 of Figure 2). These compounds are then enzymatically degraded over a period of months by Brettanomyces to the strong smelling 4-ethyl phenol and 4-ethyl guaiacol respectively (Step 2 of Figure 2). Incidentally Brettanomyces is the only major micro-organism in wine that has the ability to transform 4-vinyl-phenol into the potent band-aid® smelling, 4-ethyl phenol. Hence 4-ethyl phenol is rightly considered to be the "trademark" aroma of Brettanomyces growth in wine. Where you find 4-ethyl phenol you will invariably find Brett, and vice versa. Surveys of Australian wines have shown that detectable levels of 4-ethyl phenol is more likely to be seen in darker coloured wines, with Shiraz and Cabernet wines than wines made from either Pinot noir and Grenache. The reason for this is unclear, but may involve the coumarates which are a form of coloured anthocyanins found in red wines. Has Brett character become apparently more prevalent in recent years? Some commentators believe that we have simply become more aware of it and that it has always been around. I am sure that there is some truth in this. Upon personal reflection, I feel that classic Hunter Shiraz with its 'sweaty saddle' aroma and flavour is a very likely case in point. However, in my opinion, the overpowering, fruit destroying, antiseptic like aromas and flavours that are now occasionally encountered in wines sourced from every winemaking region of Australia is a relatively new phenomenon. The trend in this country today is to produce red wines picked from riper grapes. In addition to maximizing flavour development in some varieties, this also results in wines that are on average higher in pH and alcohol. Furthermore, residual sweetness is being retained in some commercial red wines in an attempt to fill out the palate and to give it greater apparent fruitiness. These trends together with the use of minimal SO2 and filtration, has enhanced the conditions under which Brett is retained and thrives. But is the action of Brett desirable? In my humble opinion, the answer depends on degree. As well as producing a band-aid aroma, Brett can create an array of 'interesting' smells that can excite those that are inclined to be excited by them. Furthermore, the ratio of the rather unattractive 4-ethyl phenol to the rather pleasant smelling 4-ethyl guaiacol varies substantially from wine to wine, with reports varying from 3:1 to over 40:1. In the latter case, it is highly likely that the wine would smell like the inside of a band-aid box, while in the former, the aroma would in all likelihood be far more spicy and savoury like. The reason for these differences between wines are not completely understood but are likely to be either due to differing ratios between wines coumaric and ferulic acids (the respective precursors of 4-ep and 4-eg), or to different strains of Brettanomyces being more effective in producing one compound relative to the other. 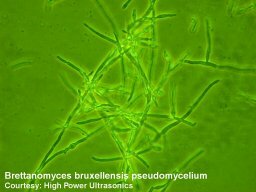 Very recent research with five different strains of Brettanomyces has not lent much support to the latter possibility. Under laboratory conditions the different strains produced roughly equal proportions of 4-ep to 4-eg in the same red wine. But the search for strains of Brett which may be low 4-ep producers will no doubt continue. In some wine growing regions such as Bordeaux, the Rhone and, dare I say it, the Hunter Valley, it is now acknowledged that some wine producers have developed 'house styles' over time that have actually been defined by some form of Brett character. Many of these producers, or the media, or both, have naively attributed these unusual and sometimes complexing characters to being 'an expression of the soil'. However, overwhelming scientific evidence in the form of elevated 4-ethyl phenol levels in their wines have forced them to admit to the less romantic notions of the microbiological origin of these characters. This is not to say that they necessarily will, or indeed should, do anything different in the future, as many Bretty house styles have become widely accepted and in some cases revered by the wine tasting public. But in the cases where a wine smells more of a hospital ward than it does wine, surely the wine-maker should begin to reflect on what wine drinkers seriously value. That is, real fruit and real complexity. Unfortunately some winemakers (possibly in an attempt to save their career), have attributed the accidental making of overtly Bretty wines as a serious attempt at making something different and complex. Wine diversity is a wonderful thing and should be encouraged in the face of continued 'internationalisation' of wines. But as Pascal Chattonet once argued. Brettyiness has nothing to do with a wines 'typicity' as claimed by some French wine producers. His counterclaim is that wines that are overly Bretty do indeed smell and taste much the same, so overt Brettyness mitigates against 'typicity' and diversity. I'm in Pascal's camp. Real 'typicity' and 'expression' indeed come from the fruit. A message that I hope is not lost on the winemaking fraternity. This work was presented at the Australian Society of Wine Education National Convention. Hunter Valley, Australia. 4th-6th of June 2004.